ProJet® 1200 Micro-SLA® Dental Wax-up 3D Printer Quickly and economically produce highly accurate and detailed wax-ups for perfect fit, every time The affordable ProJet® 1200 3D printer from 3D Systems puts the high precision and exceptionally fine feature detail of a professional 3D printer right on your lab bench. Wax-ups made on the ProJet 1200 are castable and pressable with standard dental lab equipment, so it is ideal for copings, pressed ceramics, bridges and veneers. The precision of the ProJet 1200 allows you to create unique feathered edges and crisp grooves that are commonly found on tooth anatomy. 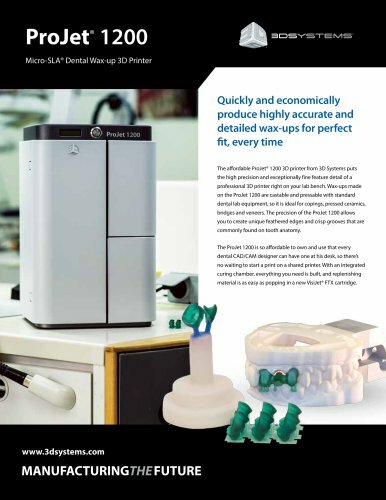 The ProJet 1200 is so affordable to own and use that every dental CAD/CAM designer can have one at his desk, so there’s no waiting to start a print on a shared printer. With an integrated curing chamber, everything you need is built, and replenishing material is as easy as popping in a new VisiJet® FTX cartridge.